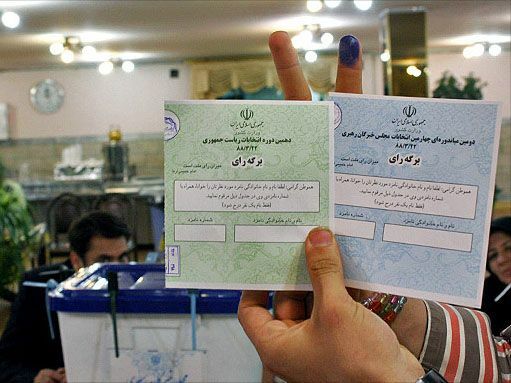 Iran's Interior Ministry has provided Press TV with the detailed list of votes cast in each province in the country's 10th presidential election held on Friday, June 12. An Iranian voter holds up her ballot at a polling station in Tehran on June 12. Mir-Hossein Moussavi won over Mahmoud Ahmadinejad in the cities of Ardabil with 140,582 to 137,220, Pilehsavar with 13,186 to 12,310, Pars-Abad with 48,521 to 31,453 and Garmi with 24,192 to 20,020. Mir-Hossein Moussavi won over Mahmoud Ahmadinejad in the city of Ganaveh with 24,885 to 23,995. Mir-Hossein Moussavi won over Mahmoud Ahmadinejad in the city of Shabestar with 39,182 to 37,099. Mir-Hossein Moussavi won over Mahmoud Ahmadinejad in the cities of Aqqala with 25,144 to 23,303, Bandar Torkaman with 36,794 to 18,577, Kalaleh with 28,740 to 23,894 and Maraveh Tappeh with 14,865 to 5,943. Bastak with 21,607 to 8,407, Parsian with 11,882 to 6,752, Khamir with 14,943 to 8,263 and Qeshm with 27,884 to 23,020. Mir-Hossein Moussavi won over Mahmoud Ahmadinejad in the cities of Paveh with 12,114 to 8,841, Javanroud with 11,888 to 10,775, Dalaho with 15,104 to 8,384 and Ravansar with 10,662 to 8,544. In the city of Khaf, Moussavi won over Ahmadinejad with 30,835 votes over 28,493. Mir-Hossein Moussavi won over Mahmoud Ahmadinejad in the cities of Baneh with 23,745 to 16,552, Saqqez with 49,519 to 24,523 and Marivan with 29,902 to 20,404. Mir-Hossein Moussavi won over Mahmoud Ahmadinejad in the cities of Iranshahr with 50,971 to 33,802, Chabahar with 62,564 to 21,185, Khash with 47,762 to 9,945, Zaboli with 14,869 to 5,897, Zahedan with 140,118 to 120,978, Saravan with 47,620 to 13,258, Sibsouran with 18,314 to 7,456, Konarak with 18,467 to 9,089 and Nikshahr with 47,661 to 25909. In the cities of Tehran and Shemiranat, Moussavi beat Ahmadinejad with 2,166,245 votes to 1,809,855 and 200,931 to 102,433 votes respectively. Mir-Hossein Moussavi won over Mahmoud Ahmadinejad in the cities of Oshnavieh with 12,690 to 8,967, Bukan with 35,833 to 16,481, Piranshahr with 24,486 to 11,270, Sardasht with 18,654 to 16,737, Salmas with 47,276 to 43,652, Showt with 13,872 to 11,130, Mako with 28,451 to 13,884; Mahabad with 38,579 to 19,999, Miandoab with 55,739 to 55,575 and Naghadeh with 32,415 to 26,419. Ardakan with 23,675 to 19,389, Sadooq with 11,399 to 10,755 and Yazd with 148,090 to 133,792.